Here’s a few success stories from readers and podcast listeners who enjoy our Gluten Free Paleo Diet and lifestyle. We hope you’re encouraged and ready to feel better too! You can send your comment in as well! MAGNIFICENT PODCASTS! Thank you, Beverly, for your advice. I just ordered your DVD, at last! Signed up for your newsletter. Love your Facebook page. Your podcasts are magnificent! You are so fun to listen to. Your interview style is superb…you keep on topic but introduce your own thoughts and experiences. Great respect for guests even if they may have different philosophies. Please keep up your inspiring and prolific work. You have changed my life. I first heard of SCD on your podcast with the two guys. Got my attention and devotion. No more stomach aches and no more arthritis pain. I really appreciate you! CHANGES IN A SMALL TOWN TOO! Hi… I should start by saying thanks for all the really valuable information about food you have given to so many people like me and my family. 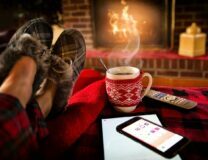 We have certainly benefitted of this and my pharmacist husband (a big fan of yours) has been suggesting your website to many people as an eye opener and guess what ??? You may not know it but many people in a small place called Memramcook have received and embraced the paleo style of living very well. After saying this I just have a question… You have said “you don’t need to eat less but right” and it makes sense to me, but what amount of meat per day should be enough/max?? Hi Beverly, Hope you remember us. I had emailed you a while back about our daughter C. (now 15 years old) and her hyperthyroidism. You gave us some great advice, thanks. Just a quick update. We made MANY changes in diet and other areas. We saw a holistic type Dr. in our area. C. is slowly moving in the right direction (after several thyroid level checks). She has now had two menstrual cycles within a normal time frame (this has never been normal since she started at age 12-13), and she has gained a whopping 10 pounds (she’s close to 6’2″ and now within her BMI). We see the doc again in February and are hoping to and see some more positive results. We will just keep doing what we have been doing in hopes that we won’t have to do anything drastic.Hope you are well and have a wonderful Christmas. P.S. Keep up the great work…..have not had much time to listen to podcasts lately… Hoping to get back into it!! Also enjoy your Facebook posts when I can. Just wanted to say I am really enjoying your podcasts and appreciate all the information you share. I have Ulcerative Colitis (15 years now) and have been 6 mos on Paleo/Primal eating and lifestyle. I have learned so much from the podcasts, specifically about signs my body is telling me, and about supplements. Of course, as I’m writing this, I cannot remember any specific quotes, but I have several memorable ones that have really helped me figure my way through this. I am starting to be able to come off my meds now and can for the first time believe that I may be able to sustain remission through my diet and lifestyle. I’ve always wanted this for myself! Thank you! Beverly, your devotion to your health practice and podcasts has really changed my life. I’m transitioning to a Paleo Diet and making observations along the way. It’s coming very natural to me and is very empowering to understand my relationship with food. I work as a dancer/bodywork practitioner in New York City and continue to spread the word on you and your work. Again, thank you. Thank you for pointing me to some additional references to deal with anxiety. I’ll look into Eckhert Tolle’s works more. I especially liked your reminder of “What’s the worst that can happen?? ?” I actually used that today… I reminded myself of what is the worst that can happen, and I realized that if the worst happened (I was thinking of what would happen if I lost my job) that I still have a college degree and my skills are still marketable, and that thanks to my debt aversion my family could live comfortably if I had to take a pay cut, or had to live off savings. I read about your DVD in a Weston Price publication and I ordered it. I thought it was so great that I ordered another one to give my brother. Just a quick note to thank you Beverly. I am 48 and until a few years ago was only seeing my regular physician. I branched out to the naturopath world a few years ago when my regular doc asked how I am feeling, I responded I am always tired. His response of “You have been saying you are tired for years” gave me a boot, and on my drive home I realized this problem is up to me. 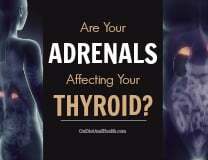 On my first visit to a naturopath I heard an understanding voice, testing began, and we found severe adrenal fatigue. Three years later your Podcast gave me another boot. You said “you need to grow up and take care of yourself”. Alluding to getting dust mites controlled, keeping the dog out of your bedroom, etc. “GROW UP” – great advice. I look forward to reading your blogs. Thank you again for all the helpful advice you have given me and my family. Since October of 2012, when I began preparation for my gastric sleeve weight loss procedure, I have lost 110 lbs, or 57.5% of my excess body weight. Thanks to your tips on smart eating and the Paleo lifestyle, I have reached the high-end average for first year weight loss for my procedure within 6 months! While I have not attained the 100% Paleo goal, the changes I have made based on your advice have paid immediate dividends to my physical and psychological health. My wife and I are faithful listeners to your podcast, and look forward to your helpful advice as we proceed on our journey towards better personal health. Hi Beverly. I am loving your podcasts and website. I only found it a few weeks ago and really love how detailed the discussions are. I’ve listened to at least 15 podcasts already. I feel very healthy and never get “sick” and lean toward a Paleo diet but I have never been strict with it. I am now starting that and am excited to see what will happen with my already good health. I think it will just get better. Thank you so much for doing what you do! I love it. PS. My husband is a vegetarian (has been his ENTIRE life–it’s cultural, he’s of Indian descent), so it’s been a bit challenging to feed both us us with such contrasting diets. The one meal that really works for both of us is breakfast–vegetable omelettes, a little aged cheddar and a big bowl of salad with all kinds of goodies in it. NO TOAST! I watched your DVD and I’ve changed my diet drastically. Some of the healthy foods do have sugar so I’ll be more careful next time (two weeks). I became interested in the food/health connection for my clients, and for my own allergies, as I had a LOT as a child. Now I get that those intolerances may affect my mental status. I’m realizing I may not have “outgrown” them, and this diet may help correct that. I’m willing to experiment until I get it right, and then maybe help clients with diet solutions to their mental health problems. I KNOW WHAT “NORMAL” FEELS LIKE NOW! 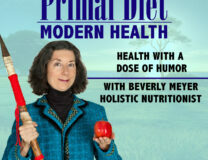 Thank you Beverly for the amazing things I have learned about diet and health from your podcasts, DVD and newsletter. Your efforts are so appreciated. At 47, I’m finally understanding my body, and the necessity to nourish it with the proper “Diet For Human Beings” as your DVD teaches. I now realize that so many of my physical issues were directly related to my diet, especially dairy. I thought what I was experiencing was “normal”. Let me assure you. I’m enjoying “normal” now! I’m thankful I can impart your wisdom to my daughter, who is 21, and can start her adult life eating properly and enjoying good health. She’s already begun! We always thought we were doing what was right. I’ve been able to lose 43 POUNDS so far, and it’s been effortless since I get to eat all the things I enjoy. The key to my success is due to the advanced planning of and preparing meals. (Thank you for the free ebook on that topic). Listening to your Primal Diet – Modern Health podcasts has been extremely educational. I’m so happy I stumbled upon your show through an iTunes podcast search. I really enjoyed your video on The Diet For Human Beings and plan to share it with family and friends soon. (Your skin is amazing…you must share which products you use with your listeners…or at least me!) Until you mentioned it, it never occurred to me that what we put on our skin could impact our health. Thank you also for your newsletter. I can’t wait to try the Crockpot Chili Cilantro chicken. It’ll go on next week’s menu for sure. Now, you should print this out and read it again when you’re having a bad day! Thank you again…Good job!….Brava! 3 MONTHS – LOOK AT THESE JEANS! My husband and myself attended Beverly Meyer’s class on the Diet for Human Beings and everything changed for us. I had already been avoiding many foods and processed things but I had NO IDEA that grains were keeping me in a suspended state of extra pounds and physical complaints. Her class was eye opening! We bought some coconut oil, her DVD on the diet for human beings and some pink salt after the class and were ready to make big changes. We also bought the book “Wheat Belly” by cardiologist William Davis. A MUST READ. I actually messaged Beverly this morning thanking her for this life-changing direction. Her class was that fork in the road!! If you can make it to one of her classes, I HIGHLY RECOMMEND doing so! I can’t wait to post my husbands loss pictures when he gets where he wants to be! WEIGHT LOSS, AND NO MORE SNORING! In seven months on the The Det For Human Beings/Primal Diet I have lost 20 pounds and gone from a size 14 to a size 10! I feel better overall and because of that I have added a moderate exercise program to my life. I only go to the gym two or three times a week, but I am now feeling the results. For years I have kept everyone in the house awake with my snoring (I would even wake myself with my snoring). After being on the diet only a short time, my snoring went away!!! Everyone is sleeping better. There are times when I miss bread and sweets (I’m from a family of bread eaters), but it is not hard to turn them aside and go for something good. And it is not hard to stay on the diet when away from home as many restaurants are becoming more aware of grain-free diets. Even airports have places where you can find foods for this diet. I have made this diet my diet for life and I recommend it to everyone. I was diagnosed with a rare neurological disease 3 years ago (CIDP), and went in search of answers I couldn’t get from my neurologist. My approach was to learn about the condition, hoping to find a way to live the best life I could under the circumstances. My research led me to Beverly Meyer and The Diet and Health Center. My first few appointments got me eating “The Diet For Human Beings” paleo diet, a huge change from my mostly vegan diet. Then a variety of vitamins and supplements came next. The combination not only got me feeling better, but to my surprise, the disease has nearly disappeared! And in a very short time too. No longer do I need 8 hour blood transfusions! Being a hyper person who can never sit still for long, you cannot imagine how much I loathed them. My legs and arms, which used to be weak and tingling, are almost back to full strength as well. Beverly Meyer is a straight talker. If you are committed to your health and are prepared to work for it, she will form a partnership with you that can improve the way you feel dramatically. The individual ultimately has to do the work themselves to be successful and Beverly is an excellent educator and motivator. Thanks for everything! The first time I met with Beverly was 3 1/2 years ago, in 2008. I was postmenopausal, and in spite of an active lifestyle and a supposedly “healthy” diet, my body was continuing to stack on the pounds. After our first consultation, I realized I would have to eliminate certain foods from my diet, and go gluten-free. At first it seemed really difficult, but I did it gradually and about 3 months later I started to see some stabilizing in my weight. I maintained a healthier weight without anymore gain. Finally, last January I felt I had plateaued and Beverly advised me to really get with the Paleo Diet, meaning no more or very few grains of any kind. I guess I was ready for the next level because it has been easier than I thought. I’ve learned to plan my meals on weekends by cooking and freezing and having lunches ready for the week. I’ve now lost the weight AND I have my waist back! I have more lean muscle mass and feel as good as, if not better than, before menopause. The changes have been challenging but well worth it for me. Thanks Beverly. IRRITABLE BOWEL SYNDROME AND MY FAMILY! I can honestly say that Beverly Meyer and everything she has taught me about The Diet For Human Beings saved my life and my daughter’s life. I will forever be grateful to her and her wisdom. My daughter suffered from IBS since birth and developed chronic fatigue in high school. I too have suffered from IBS my whole life and was headed down a road of chronic illness. Not one doctor (and there were many) ever mentioned anything about the food we were eating and how it might be the contributing factor to all our troubles. Since working with Beverly and following her Paleo Diet, both my daughter and I are the healthiest we’ve ever been. People ask me all the time if I miss bread, pasta, cake etc… But I just say that if you don’t have your health, everything else in your life suffers. It is not worth it! Thank you Beverly!